Easy Company 1st Lt. Hanks lays down a few rounds of covering fire after parachuting in from the dining room table. LOS ANGELES—Two-time Academy Award winner Tom Hanks, 53, once again invited a group of friends to his home and forced them to play a make-believe game of World War II with him, sources reported Saturday. Director and producer Ron Howard, one of the guests, confirmed that Hanks made his visitors pretend they were a battalion of Allied soldiers for more than six hours. According to sources, Hanks barked out pretend mission objectives to his friends before issuing uniforms and M1 Garand rifle replicas to Springsteen and Short. Due to a “recent attack on supply lines,” Howard was given a green sweat suit and a tennis racket meant to be held backward like a gun. Sources close to Hanks said the world’s No. 1 box-office star regularly forces family, friends, and delivery people to pretend they’re fighting World War II with him. 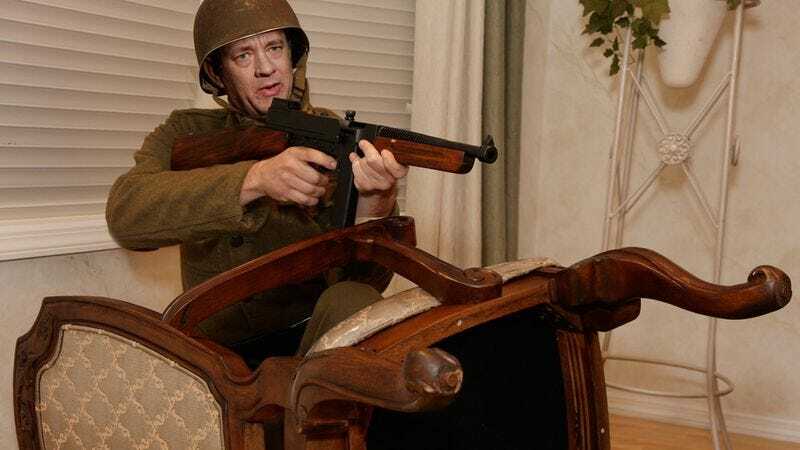 Though he has been seen splashing in his pool on an inflatable lounger while shouting about kamikaze attacks, past houseguests confirmed Hanks’ favorite thing is playing Western Front. On Saturday, Springsteen, a 20-time Grammy winner who has sold more than 120 million albums worldwide, acknowledged that Hanks was highly critical of his performance during the afternoon’s World War II game. Hanks was also seen pointing at two chairs covered by a blanket and ordering Howard, Springsteen, and Short to “hit the barracks so you can write your gals back home and still get some shut-eye.” He then encouraged them to make snoring sounds to simulate sleep, and several minutes later hummed reveille through a closed hand he said was a bugle. Next-door neighbor Stan Herzig, who was “drafted” last month when Hanks told him Uncle Sam needed an elite paratrooper to join Alfred Molina and Julia Roberts on a special mission behind enemy lines, said he would prefer the actor find a different game to play. Short told reporters that Saturday’s invasion of Normandy was called off when Rita Wilson, Hanks’ wife, kicked the group out of the house, claiming everyone was making a mess and it was too nice a day to be inside. Though Short said that Hanks “always has to win, even when he’s playing Germany,” he admitted the afternoon could have been worse.